It’s that time of the week again, and PCGamesN returns to help you cut through the noise, and tune your signal into some of the most intriguing experiments in the indie scene this week, one enticing image at a time. Check out the latest crop below, and check back next week for more. Plus check our our lineup from last week, November 25th, if you missed it! As with last week, these games are picked from the most recent roundup on the #ScreenshotSaturday tag, but if there’s a better trailer available than the latest animated GIF shown, we may use that. 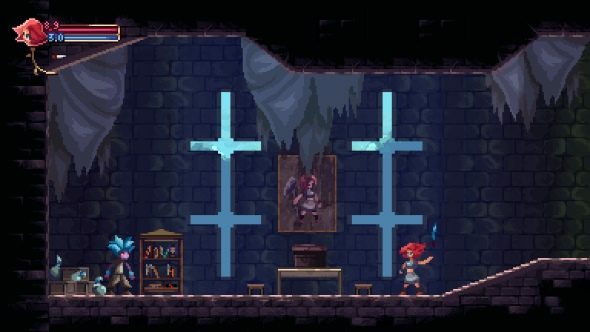 Starting us off this week with something familiar, Nightkeep is a charmingly sprited gothic Metroidvania, very much in the style of the classic Castlevania: Symphony of The Night, but with a few nods to the classic non-Metroidy castlevanias of years past. I especially like seeing a return of the whip-spinning move, ideal for protecting yourself from swarms of fragile little flying enemies. Despite the projected release date being a long ways off, it sounds like the game is surprisingly far into development, with about half of the game-world being (mostly) complete already, although not yet populated with NPCs and story events. The game is crowdfunding via IndieGoGo to help give development a boost, and there’s a demo available to try there, too. The developers Twitter feedhas some fresh bits too, but the lion’s share of it can be found on the Indiegogo page already. Unless you’re a truly old-school shmup fan, the name Twinkle Star Sprites probably means nothing to you, but that cute and obscure Neo Geo arcade game’s influence is still being felt decades later, and especially strongly in Rival Megagun. Simply enough, you turn a shmup into a competitive game, ala Puzzle Fighter. Two screens filled with enemies to kill in combo-chains. Successful chaining results in more threats being sent to the other player, or an opportunity to deploy a boss to their side of the playfield. Rival Megagun looks to adhere pretty closely to the Twinkle Star Sprites formula, with a few fun tweaks. Most notably, rather than merely deploy bosses to the enemy side of the screen, you become the boss and fly over there yourself, turning the whole concept of the genre on its head for a few moments. There’s not a huge amount of detail on the game at present, but you can find out more on the official site, and see plenty more of it in motion over on the developer’s Twitter. Here’s one from the upper end of the indie spectrum. Massive Work Studios may be independent, but the Brazilian studio are far from tiny, and it shows in the trailer above. Questionable framerates aside, Dolmen looks to be a pretty high end sci-fi action adventure. Playing as a lone lost human awakening deep within a hostile alien planet, you’ve got to contend with all manner of hostile flora and fauna (as well as some sentient locals, as seen above) as you search for the reason for your lonely appearance in such a deadly place. It kinda makes me think of a 3D take on Axiom Verge, although that’s just gut feeling and wild speculation. As with a surprising number of games covered in this column, Massive Work Studios hail from Brazil – it would seem that South American studios really are on the up-and-up in recent years, and are carving out a significant niche in the indie sphere. Dolmen is currently looking for alpha testers, and in four months or so, the developers plan on launching a Kickstarter to help push the game past the finish line. You can find out more about both drives on the official site, and see a little more in-development footage on their twitter feed. Solar Warden – an Indie game by the Co-Founder of MechWarrior: Living Legends. As far as I’m concerned, you can never have too many space combat games, and Solar Warden‘s creative blend of traditional dogfighting action and Descent-style 6-Degrees-Of-Freedom shooting seems pretty exciting. Earth is under attack (when is it not?) from aliens hiding out inside asteroids, so you’ve got to clear out Earth’s orbital space by shattering smaller asteroids to kill the critters within, and dig deep into the core of larger rocks in order to clear out the threats up close. You can see a bit more footage (including some impressive terrain deformation tech) on the official twitter feed for the game, and the project is soon to start crowdfunding. The developer was previously involved in the creation of Mechwarrior: Living Legends, which despite being a fangame, I still believe it to be the best (multiplayer) mech game ever made, allowing you to control aircraft, tanks and power-armor as well as the famed 100-ton killbots. That’s good pedigree to have. Nobody said ‘indie’ had to be synonymous with ‘classy’. Reginald Does His Thang is a very stupid puzzle-platformer about eating things, un-eating things, dying, and coming back to eat your own body and heave its gory chunks all over the landscape in order to solve your problems, including combat, dynamically spreading fire and a multitude of extremely deadly spike pits. Along the way you’ll find ways to expand your repetroire of puking, including elemental ice and fire spew – it’s a bit Metroidy, but in a very gross way. As mentioned, in order to up-chuck all over the world, you need to fill your stomach, and anything vaguely edible will suffice, up to and including your own corpse piles from failed attempts to get past obstacles. Yummy. Reginald Does His Thang is set for release very soon –December 7th, if its Steam store entry is to be believed. That’s it for this week. Got any favourites you want to share? Post them in the comments below, and if you’re a developer and want to see your game here? Tweet about it on #ScreenshotSaturday.